This Package Cannot Be Sell For Less Than $97 But This Is A Special Limited Offer To The First 10 Smart Marketers, After That, The Price Will Increase And No...This Is Not A Joke. "Click And Drag Your Way To Killer Graphics Just Like The Ones Below!" If you want to create graphics yourself, this product is for you. Everything You Get With The Click & Drag Graphics Package. These "starter templates" are simple blank templates with a few subtle "effects" that spice them up. Even though these templates are simple, they look very professional with their subtle effects. And they are generic enough to be used for ANY kind of website theme. So what ever you're selling or giving away, or what ever your site is about, you can use these templates for your designs. You can simply add your own text to these templates and you'll have a simple yet professional cover ready to go in minutes. Or you can take the starter template, and add a few images to it, and make the cover more complicated. It's all up to you how much time and effort you want to put into creating your design. You get starter templates for headers in 3 different sizes (650, 700, and 750 pixels wide) and each cover shape (ebook, box, cd, report, ezine, member card, etc.). With all these different variations, you'll be getting hundreds of templates to choose from. *Requirements: Photoshop 6, 7, CS, CS2 or CS3. This module is what makes this package so easy to use and so unique. No other package offers anything like these Click & Drag objects. With these Click & Drag objects you can literally create a professional and eye catching design for your site in minutes. Just click and drag these objects into place, it's that easy. It's kind of like those drag and drop dolls for girls that come with different clothing that you can place onto the dolls by dragging them. But here instead of dolls we have website headers, covers, and other graphics. Text - already preformatted with the proper font, size, and layer style effects. Just drag it over to your header or cover, change the text to your own product or site name, and you're done. Text Bars, Squares, Circles, Stars, and Corners - these are the little shapes that go behind your text to make it stand out more and give it emphasis. Horizontal Bars - These go across your whole header or cover to divide them into portions or to give that finishing touch. All of these objects come on their own layers and are completely customizable. So you can resize them, rotate them, change their colors, change the text to what ever text you want, etc.. You can customize them to your liking. You'll get dozens and dozens of these click and drag objects, in all kinds of different shapes, styles and colors. There is really a huge variety to choose from, so what ever "style" you're going for, you'll find it here. Layer styles add an effect to your layers with one click. So if you want your text to look "cool" you can add a spicy effect to it by simply clicking on one of the layer styles. It's really easy. Just type your text, click on the layer style you want to apply, and your text will get an effect. These layer styles also work on ANY layers, not just text. You can apply them to things like web buttons, headers, footers, banners, logos, etc..
You can go from plain text (or any other graphic), to text with a simple effect, to full blown cool looking text, just like below, all with a few simple clicks. And don't worry, even if you know nothing about layer styles and how to use them, I have step-by-step easy to follow instructions to guide you all the way. So you'll be able to create cool looking text literally minutes from going over the instructions. And even if you do know what layer styles are, and already have a set of your own, I'm sure there are a few nice styles here that you don't already have. These layer styles, patterns and gradients are what give a design that professional look. Now you can add these professional effects to your own designs with just a few clicks of the mouse. It's a really amazing thing the first time you see these action scripts work. It's almost like magic. In total you get over 60 high quality eCover action scripts. Plus, this package is constantly being updated so what you see here is just a start. There is much more stuff inside, and more being added on a regular basis. All of these additional templates come with fully layered PSD source files, so you can easily customize them all. This package comes with easy to follow, step-by-step, screen capture video tutorials. Everything is broken down for you in simple terms, so even if you're a complete newbie you'll be able to get started right away. I've also included some more advanced tutorials for those with more design experience. After doing mini site and eCover graphics for over 3 years now, I've picked up a lot of tricks that even design pro's will find useful. Ever been stuck for design ideas? Have a hard time coming up with the right "look" or color scheme for your cover? With this graphics swipe file you'll never be stuck for ideas again. You'll get over a hundred of my own favorite designs that I've done for my clients (covers, headers, order buttons, footers, and backgrounds). A lot of these designs are not listed in any of my portfolios on my sites. You'd have to spend dozens of hours scouring the internet to find just half of these designs on your own. This swipe file will save you countless hours of frustration and "being stuck". Note: The graphics in the swipe file are flat JPEG files, and not PSD source files. They're meant as a source for ideas and inspiration (a swipe file). * Where I get my stock images from. *Where I get my fonts. *Where I get my ideas for designs. *A cool place to get hundreds more layer styles, patters, brushes, textures, and more. This resource module will save you hours of trial and error time trying to locate all of these places on your own. So as you can see, this package has pretty much everything you need to create professional graphics yourself. All of these modules come together into an integrated "click and drag" system. So you can literally click and drag your way to great looking web graphics. I've never seen a more complete design package online. There's just nothing else like it. 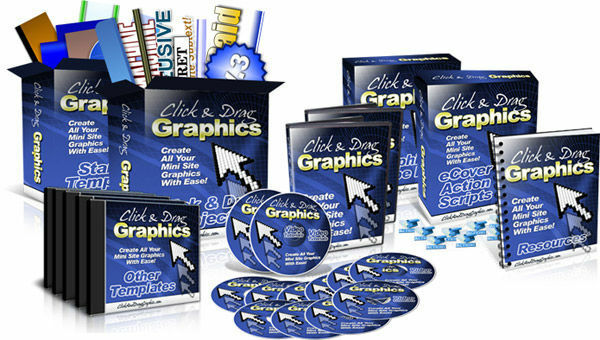 Click & Drag Graphics - Very Special Package graphics click drag cover expert cash 129483194 81.00 daytoshopmaster Fresh Download Available!